The initial design criteria for architectural fabric structures is critical when looking at the long-term performance of your structure. 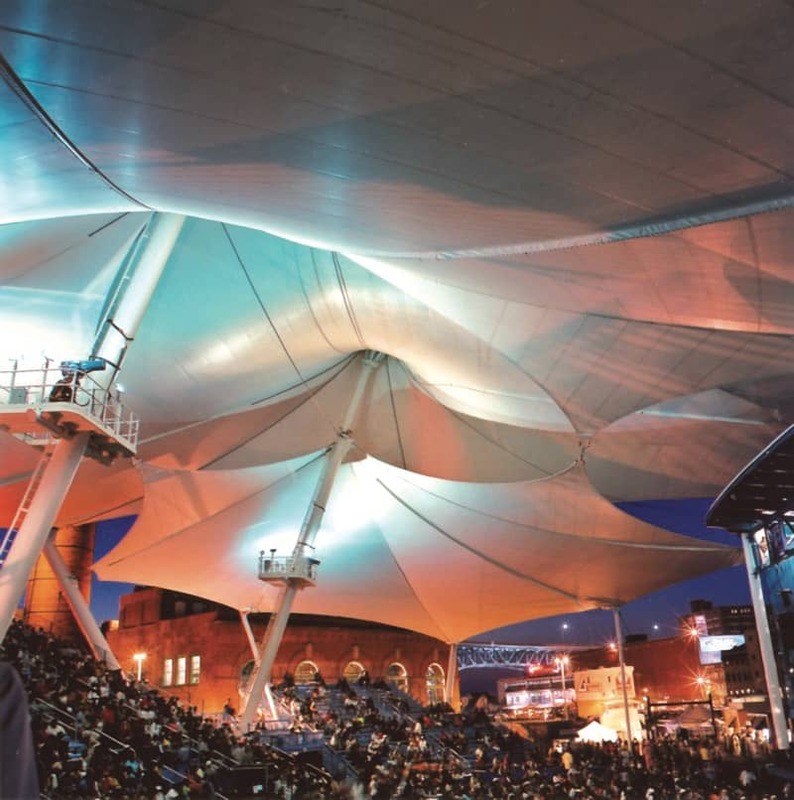 Consideration must be given to the architectural fabric skin such as proper tensile strength, flame resistance, weight, coating adhesion, type of coating, and top finish to ensure the performance of the structure. When creating a design for your architectural fabric structure, consider the following five factors. There are codes and regulating bodies that further support and govern architectural fabric structures to uphold performance properties. The architectural fabric skin provides for a long-term, watertight membrane to protect your assets. If the outer fabric skin is damaged by a puncture or tear, the structure will no longer be watertight. Wind-whipping, the act of the fabric whipping in the wind, of the architectural fabric can result in a puncture, tear, improper tensioning and further degrade the outer skin. The base cloth plays a significant role in prohibiting this damage. Proper tensioning of the material on architectural structures is also an important factor. A high strength base cloth, the foundation of the architectural fabric, provides for a durable outer fabric skin to resist damage. Repair of the damaged area should be performed immediately, by utilizing the same material as the architectural structure. Ultra-violet light, acid rain, and environmental elements can affect the performance of your structure. These elements can degrade the coating and top finish resulting in exposure of the base cloth. Once this occurs, failure is eminent. A properly engineered architectural fabric coating will be formulated to mitigate the damage by these elements. UV resistance can be determined in a laboratory setting during development of the coated fabric and data may be available for your review. Typically 1000 hours of laboratory weathering equates to one year of exposure. This varies depending on the location of the structure. The top finish provides another layer of protection in addition to improving the cleanability of the structure. A structure that appears dirty is generally an aesthetic issue and does not affect the long-term performance of the structure. Unlike standard top finishes, Tedlar, a continuous film, provides superior protection of the architectural coated fabric and color stability. This technology has been used on architectural siding for decades and on architectural fabrics by Seaman Corporation for over 30 years. Proper maintenance is the key to the performance of architectural structures. As discussed previously, follow the structure supplier’s maintenance requirements to provide for a high performance long-term architectural fabric.